It is next to impossible to keep them as crisp as they were the day you took them out of the box. And there is absolutely nothing attractive about yellowing sneakers or white shoes spattered with black marks. It totally ruins your look. Owning a pair of white shoes is a commitment. And while the good ol’ white sneakers are the most comfortable pair of shoes that you own, they are also the trickiest ones. But fret not. 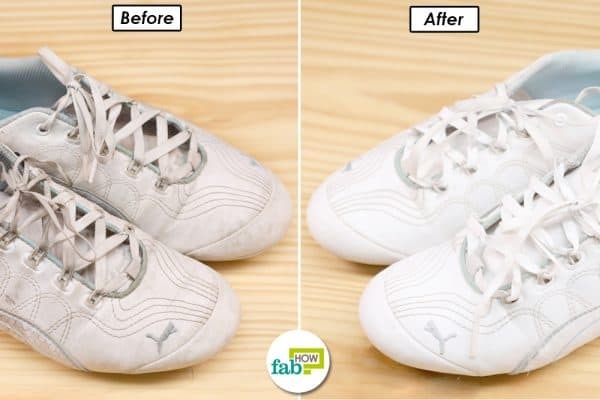 We have here two incredible ways for cleaning your pearly white shoes. 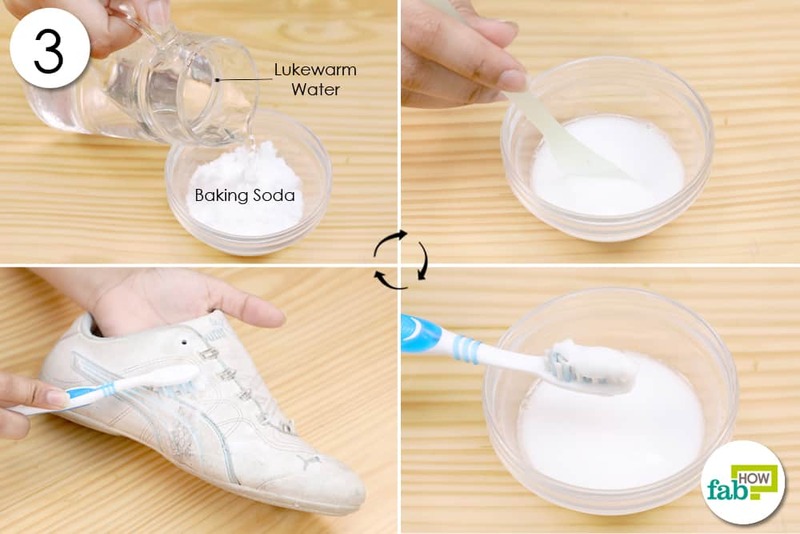 Go on, scroll down for the easiest methods to clean white sneakers and make them look brand new. With this simple method, you can clean your sneakers, Vans, Converse, and canvas. The main ingredient in this method is the baking soda. It is one of the best cleaning agents, easily available in every household. 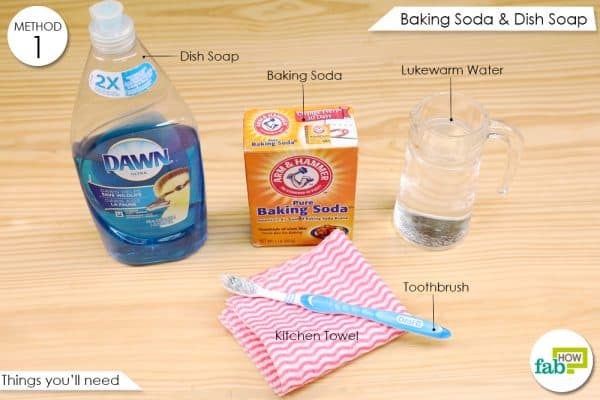 You can use baking soda for cleaning around the house in a number of ways, may it be cleaning the dirty tile floors to cleaning your white sink. Before cleaning the shoes, it is important that you clap the shoes together to shake off as much loose dirt as possible. Add 2 teaspoons of dish soap to it. Mix and swirl it until it lathers and bubbles. Remove the laces from your shoes. 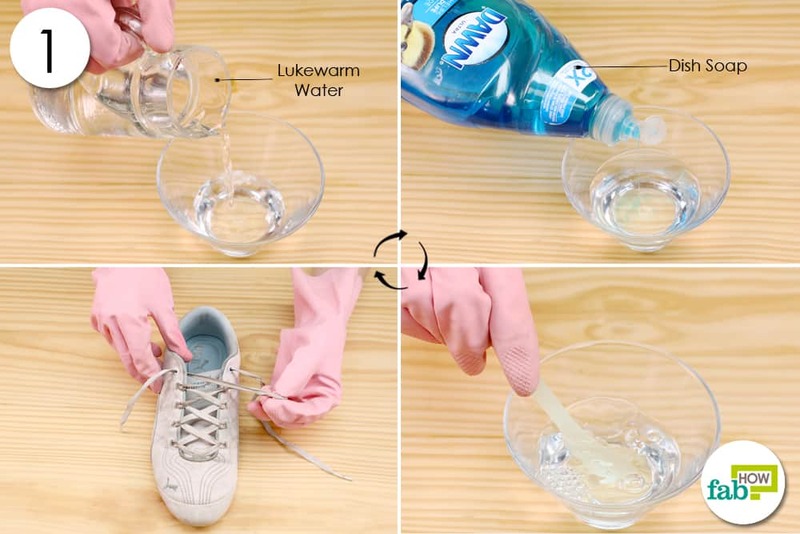 Dip the shoelaces in the dish soap solution and let them soak for 10 minutes. You can also use this solution to clean your running shoes at home easily. 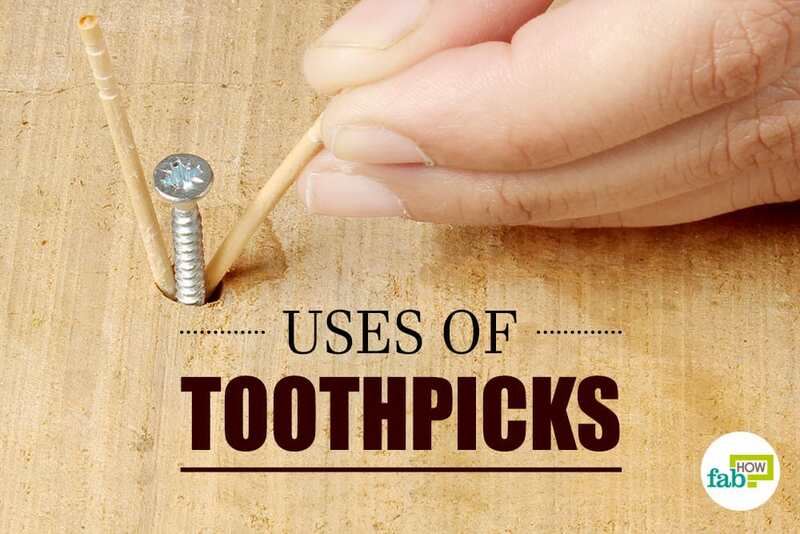 Brush off the dirt on the laces with a toothbrush. Remove the laces from the water and scrub out any stubborn stains on a flat surface. Add lukewarm water to it enough to make a paste. Mix the baking soda in the water until you get a thick, pasty consistency. 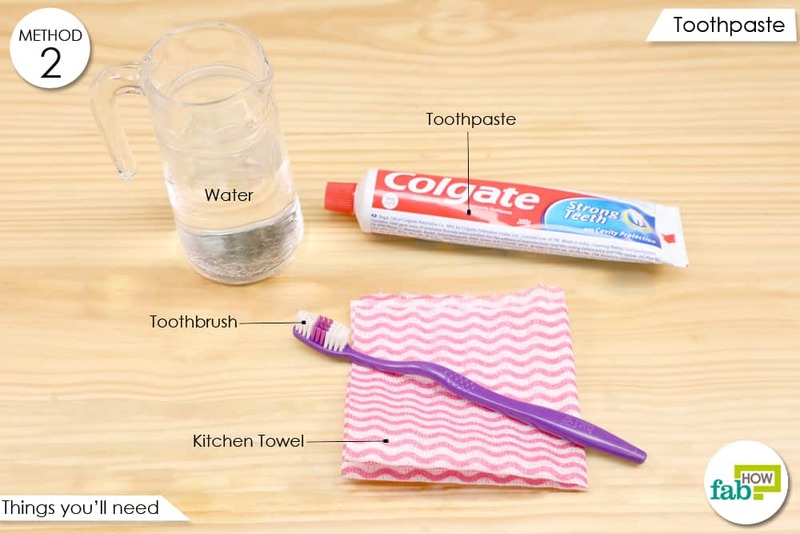 Dip the toothbrush in the baking soda paste. Gently scrub the paste in circular motions to clean the dirt off your shoes. Go over the entire surface of the shoes with the paste. The baking soda paste dries very quickly and will start to crack and fall off. You can clap the shoes together to make more of the dried paste fall off. Dip a kitchen towel in a jar of water. Remove any remaining paste from your shoes with the damp towel. Put your shoes in a warm or sunny location for 2 to 3 hours to let them dry completely. Note: If you are cleaning your Vans with this method, do not place them in direct sunlight to dry. It may cause them to discolor. Apart from cleaning your house and adding shine to it, toothpaste also works great for cleaning your white sneakers and make them look brand new. It does not require too much of an effort either. Before cleaning the shoes, do dust off the excess dirt. 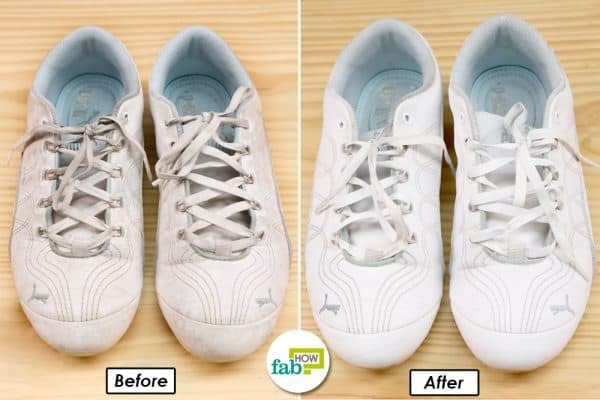 You can clean the shoelaces as described in the first method using a dish soap solution. Rub the toothpaste on your dirty shoes. Work the toothbrush in circular motions all along the shoes. Leave the toothpaste on the shoes for 10 minutes. Pour some water on a kitchen towel to make it damp. Wipe the paste off the shoes with the damp towel. Your brand new clean white sneakers are now ready for use. You can use a soft-bristled shoe brush to remove loose dirt every time you wear the white shoes. If you are looking for how to clean your canvas shoes, you definitely have landed up at the right place. 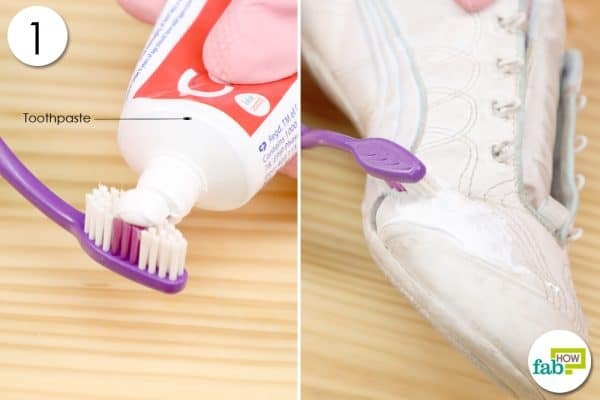 Use only non-gel white toothpaste for cleaning the shoes. The colored toothpaste might leave a stain on white shoes. You can also clean your flip flops at home using baking soda and some common household ingredients. You can keep your shoe odor-free by using our hacks to get rid of foot odor. You can also leave some dryer sheets or sprinkle some baking soda inside your shoes to deodorize your shoes. Leather boots are a category of footwear that lasts for years with some simple cleaning tips and hacks. Learn here the three staged process of cleaning and restoring your dirty leather boots at home. You can wipe the shoes with a damp washcloth before you start the cleaning process. It will remove any lose dirt attached to the shoe exterior or sole. Thanks for this! I am certainly gonna give this a try!